James DeGale and Chris Eubank Jr. finally get to settle things in the ring. The pair of British super middleweights and longtime domestic rivals will collide on February 23 at The O2 in London, with the bout formally announced at a press conference held on site Thursday afternoon. “I’d like to say how personally proud I am of this new relationship between Premier Boxing Champions and ITV,” stated promoter Richard Poxon, whose Poxon Sports will present the event live on ITV Box Office in the UK. “This is a fantastic all British super-middleweight fight that takes us back to the glory days on ITV. There will be far less at stake than was the case when the two were first on each other’s radar. In the time that has passed since interest in such a grudge match first made the rounds, DeGale (25-2-1) has won, lost, regained and vacated a super middleweight title. Meanwhile, Eubank Jr. (27-2, 21KOs) will enter fight night barely a year removed from his disappointing points loss to George Groves in their title fight last February. A win would’ve advanced the second-generation boxer into the World Boxing Super Series finals versus Callum Smith; instead, it left him without a career-defining win and a lot to prove. It also made it easier to finalize terms to face DeGale, a fitting debut for PBC expanding its brand to the United Kingdom four years after its initial U.S. launch in 2015. Of course, being the son of legendary former two-division titlist Chris Eubank Sr. made him recognizable name from the moment he turned pro in 2011. What caught the eye of his upcoming opponent, though, was Eubank Jr’s awareness of those around him at that time. “This fight has been a long time coming,” acknowledges DeGale, a 2008 Olympic Gold medalist for Great Britain and two-tour super middleweight titlist. “A lot of people have been calling for this fight. Chris has been calling for this fight. The moment will come without a major belt on the line. DeGale regained his title in a points win over Caleb Truax last April after suffering a shocking loss to the American in Dec. ’17, which initially ended his 2 ½ year title reign. His first title win was a historic moment, becoming the first ever Olympic Gold medalist from Great Britian to win a major title in outpointing Andre Dirrell in their May ’15 clash. The second tour was short-lived and without fanfare or even a single defense. DeGale opted to vacate in order to search for bigger fights rather than be contractually bound to a mandatory title defense versus Jose Uzcategui. Among the bouts discussed was an eventual showdown with Eubank Jr., a fight that was factored into PBC moving forward with its long-discussed plans of launching its brand in the U.K. market. Both boxers took on separate tune-ups in the interim, each scoring 3rd round knockouts just two days apart. Eubank Jr’s return to the win column came in an uninspiring stoppage of JJ McDonagh last September in Saudi Arabia, on the undercard of Smith’s knockout win over Groves to win the WBSS super middleweight tournament. Two days later, DeGale claimed an early hit of Mexico’s Fidel Monterrosa in a bout buried deep on the non-televised portion of a PBC on FS1 show in California. Little was made of either contest, other than marking time for their eventual head-on collision. Whereas such a fight could have arguably declared the best super middleweight in the world a year or two ago, the February 23 clash has become must-win for both boxers. The sentiment wasn’t exactly shared on the other side of the dais. What has entered his mind, however, was getting game-ready for this bout and functionally for the rest of his career. The 29-year old admits to having been self-trained for his past few contests, but will enter this under the watchful eye of a new—and full-time—coach. “I haven’t really had an official trainer,” Eubank Jr. confessed in regretting past decisions that have left him in must-win territory. “Ronnie Davies has always been with me, but was never my full time trainer, he was more of an overseer. I was basically training myself. It will have to, as Eubank Jr. has yet to land the type of breakout victory that has advanced his career from potential to confirmed greatness. He was aggressively moved early in his career, perhaps not quite ready for “the next level” in dropping a dull 12-round decision to then-rising contender Billy Joe Saunders, who would go on to win a middleweight title. The path was similar to that of DeGale, who was paired early in his career with Groves when both were unbeaten prospects. Groves won a tightly contested decision, but it was DeGale who would be the first to win a major title in outpointing Dirrell on U.S. soil. Three successful title defenses followed, including a 12-round draw with Badou Jack in their Jan. ’17 war. DeGale—who turns 33 in February—remained with a belt around his waist, but the majority draw coupled with the upset loss to Truax that following December left the Brit without a win since barely getting past Rogelio Medina in April ’16. He now enters this grudge match with two straight victories. The former two-time titlist is also equipped with the more proven track record in big fights and—he believes—has far more left to offer the sport, which he doesn’t believe to be the case for his future opponent. The UK has yet another option for big time boxing to look forward to in 2019. 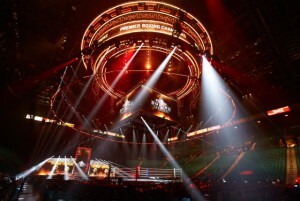 Last week it was announced that ITV had signed a deal with Haymon Sports to show exclusive coverage of Premier Boxing Champions events in the UK. ITV had shown last season’s World Boxing Super Series on their ITV Box Office channel however this deal will have a mix of free and Box Office, it seems. The first two shows that will be covered have been announced and will be free to air on ITV 4. Before Sky and more recently BT Sport, ITV were the kings of boxing in the UK and it will be a welcome return to free to air boxing on the channel. The first fight to be shown is the Jose Uzcategui v Caleb Plant for the IBF Super Middleweight World Championship on January 13th from the Microsoft Theatre in Los Angeles. Then the following week it’s Manny Pacquiao v Adrien Broner for the WBA World Welterweight title. The deal between ITV and Haymon Sports/PBC is the first that Haymon Sports/PBC have partnered with a UK broadcaster to show regular events. In a three year deal, a minimum 15 events a year will be screened a year, with events being held both in the UK and U.S.